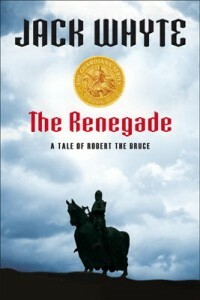 The Viking, Canada cover of “The Renegade” features the statue of Robert the Bruce brought home to Calgary, Alberta, by Eric Harvey, the man who sparked the Alberta Oil Boom. It is the “understudy” casting, the twin of the original that overlooks the battlefield at Bannockburn in Scotland. On a beautiful autumn morning in the early stages of writing this book, I found myself sitting in the sunshine gazing at a portrait of the middle-aged Robert the Bruce, King of Scots, and remembering two grand old men whom I had known as a child. They were brothers, Edward and Michael O’ Connell, and their youngest sister was my maternal grandmother. They were both fierce looking, hawk-like men, tall and gaunt and broad-shoulered and stern, with big ears, prominent, beaky noses and a proud, independent air about them. The portrait of Bruce reminded me forcibly of both of them, not merely the physical elements of their heads and faces but their defiant posture and their unyielding expressions of determination and uncompromising strength of what used to be known as character. Those two upright old men shaped me when I was a boy too young to be aware of it, and one of them, the one I came to know best, became the model on whom I built one of my strongest protagonists, Caius Cornelius Britannicus of “A Dream of Eagles”. On that particular day in 2012, though, it was the elder brother, Edward, whom I could see in the face of Bruce, and as I sat there wondering why, and why the thought should have occurred to me, I experienced one of those quasi mystical flashes of understanding and enlightenment that is known as an epiphany. I had been wrestling for weeks with an anomaly that, though seemingly trivial at first notice, had nevertheless perplexed me to the point at which it had become intolerable and was seriously affecting my approach to my story. It had occurred when I realized, almost incidentally, that in reading everything I could find on the Bruce I had become aware that academic historians (not speculative fiction writers like myself) were virtually unanimous in admitting, to varying degrees, that they were at a loss to explain why Robert the Bruce, at several crucial and seminal times in his life, behaved as he had, apparently in defiance of all logic. In each of those instances (and all the historians agree on what they were,) his decisions and subsequent actions appeared to lack an identifiable purpose or an attributable motivation. And then I saw that picture, reminding me of those two grand old men, and saw that Bruce, too, had his exemplar. Robert the Bruce was the seventh of his name, the seventh consecutive Lord Robert Bruce, and the fifth of those was Robert Bruce of Annandale in southern Scotland. Bruce of Annandale came to be widely known as Bruce the Competitor, because in the aftermath of the death of King Alexander III and then of his heir, the seven-year-old princess known as the Maid of Norway, Robert Bruce of Annandale had one of the two strongest claims to the throne of Scotland, and came within a coin’s toss of being crowned King of Scots. But the astonishing thing was that, in an age when most men were dead by the age of forty, the Competitor was seventy at the time of the competition. This man, the Bruce’s grandfather, was one of the greatest nobles of his time, not only in Scotland but throughout Christendom—for Europe, as we know it today, lay years in the future. He bore the royal blood of several countries, including England and France, and he must have been formidable, because his friends and intimates called him The Noble Robert, but he has been entirely eclipsed by the fame and the glory of his Grandson, Robert the Bruce, King of Scots, and history has largely forgotten him. His grandson Robert, though, could never have forgotten him, reared as he was at the fierce old warrior’s knee and eager to learn everything the old man had to teach him, and therein lay my epiphany that morning. Considering those two, pupil and teacher, and knowing the tenacity, nobility, integrity and strength of purpose of the elder, how could anyone doubt or question the decisions the grandson made at any stage of his brilliant career, when they were underpinned and reinforced by the lessons learned at the old man’s knee? And so I started again, at a new beginning, and went looking for the story of the boy who would be king.